CPO Kardash, one of Leduc's finest, braves the cold and hands out a sweet treat while reminding motorists to drive safely over the holidays. On Friday, Dec. 13th, motorists driving along 50th St. in Leduc might have thought they were coming upon a big accident that happened in front of the Protective Services building, what with police cars all over the road with their lights flashing and about a dozen officers spread across the road directing traffic, but, thankfully, nothing could be further from the truth. In fact, the officers were out braving the cold trying to prevent accidents. The annual Candy Cane Check Stop was underway with officers from the Leduc RCMP and Peace Officers from the City of Leduc, joining forces with volunteers from the Leduc & District Food Bank and Alberta Health Services, to meet the citizens face to face in a positive way in order to reinforce the ever important message not to drink and drive. The Candy Cane Check Stop originated in Alberta over 10 years ago and enforcement services run it in partnership with MADD Canada. The purpose of the Candy Cane Check Stops are now multifaceted with the main focus on educating people to remain safe during the holiday season by not drinking and driving and also to practice defensive driving over the winter months by using simple driving strategies such as leaving some extra distance between vehicles as you are travelling and having your headlights on. A statement on the MADD website says "It reinforces the message that we all have a role in promoting safe driving habits and the fight against impaired driving, to keep our community safe for all residents and visitors." C.P.O. Malaine Wark, who has participated in the Candy Cane Check Stop for the last three years states that this year's campaign was "Phenomenal!" In every aspect. "We probably had more than 500 cars pass through the check stop in a two hour period with some people even telling us that they specifically came through in order to donate to the food bank!" 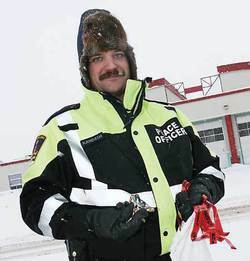 In a move that has seen the Candy Cane Check Stop become a collaborative effort in Leduc, while officers and volunteers hand out sweet treats to motorists and advise them on winter driving safety Leduc & District Food Bank volunteers also accept donations from drivers, some of whom make it a yearly event to go through the check stop so they can donate as a family. This year over $1,200.00 was raised for the food bank at the check stop. "I'm so impressed with our RCMP members and CPO's because it was a record turn out of officers this year and it is a fantastic way to get a message out that needs to be received, and that is to drive safe!" Along with candy canes, officers also handed out red MADD ribbons that people could tie on their antennas and the volunteers from AHS were giving out health and safety pamphlets.